Robyn Handbury is dedicated to working towards making hospitals friendlier for patients, visitors and staff alike. In 1996, she joined forces with her sister, Patricia Cameron-Hill and brother-in-law, Shayne Yates, to bring Dr. Patch Adam's to New Zealand and Australia to share his message with health care professionals and communities. 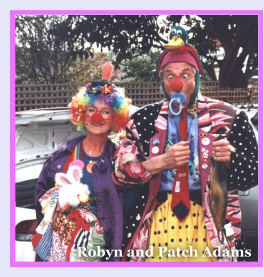 Robyn (clown character Carrottop) has clowned at St Vincent's Hospital in Melbourne and in 2000 joined the "Patch Adams Clowning Around Russia Tour". In consequence she has a special interest in adult hospital visiting. Robyn contributed towards the success of the writing and publication of the book Doctor, I feel funny and made it available to hospitals in Australia and New Zealand. Her goal is to have a copy of the book in every patient's locker in Australia and New Zealand by 2002. She is also assessing the book for other cultures, especially in the United Kingdom and the United States. Her website is a forum for information, ideas exchange and support for people around the world who are working to humanise their hospitals.